Kyle Grillot - kgrillot@shawmedia.com Marian Central senior Ephriam Lee can't catch Montini sophomore Dylan Maher as he extends to catch a ball during the third quarter of the Class 5A second round football game between Montini and Marian Central Friday in Woodstock. 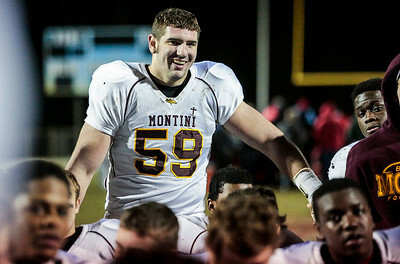 Montini won the game 40-7. 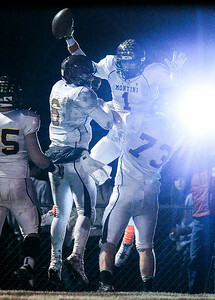 Kyle Grillot - kgrillot@shawmedia.com The Montini team celebrates with junior Leon Thornton III after scoring a touchdown during the third quarter of the Class 5A second round football game between Montini and Marian Central Friday in Woodstock. Montini won the game 40-7. 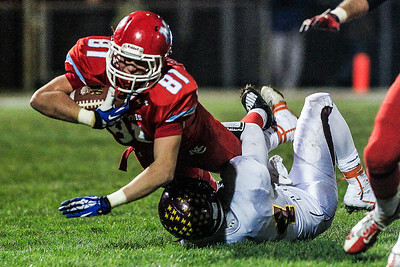 Kyle Grillot - kgrillot@shawmedia.com Marian Central senior Brett Olsen tackles Montini junior Leon Thornton III out of bounds as he pulls in a catch during the first quarter of the Class 5A second round football game between Montini and Marian Central Friday in Woodstock. Montini won the game 40-7. 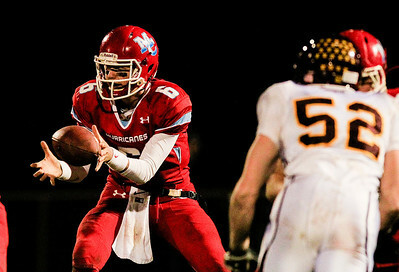 Kyle Grillot - kgrillot@shawmedia.com Marian Central junior Jordan Miemeyer can't catch Montini senior Prince Walker as he scores a touchdown in the second quarter of the Class 5A second round football game between Montini and Marian Central Friday in Woodstock. Montini won the game 40-7. 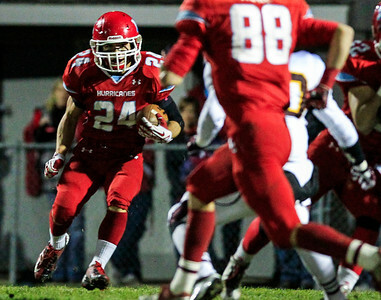 Kyle Grillot - kgrillot@shawmedia.com Marian Central sophomore Jarryd Cabusao runs the ball during the first quarter of the Class 5A second round football game between Montini and Marian Central Friday in Woodstock. Montini won the game 40-7. Kyle Grillot - kgrillot@shawmedia.com Marian Central junior Billy Bahl pulls in a snap during the fourth quarter of the Class 5A second round football game between Montini and Marian Central Friday in Woodstock. Montini won the game 40-7. Kyle Grillot - kgrillot@shawmedia.com Montini senior Dylan Thompson smiles with his team as he listens to his coaches after beating Marian Central in the Class 5A second round football game Friday in Woodstock. Montini won the game 40-7. Kyle Grillot - kgrillot@shawmedia.com Marian Central junior Matt Ricchiuto extends for a first during the second quarter of the Class 5A second round football game between Montini and Marian Central Friday in Woodstock. Montini won the game 40-7. 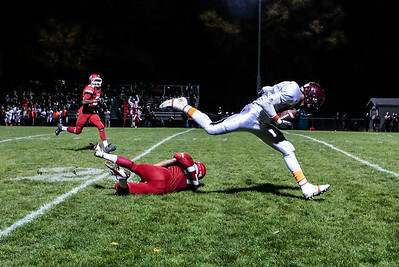 Kyle Grillot - kgrillot@shawmedia.com Marian Central senior Brett Olsen falls while trying to stop Montini junior Leon Thornton III from scoring a touchdown during the first quarter of the Class 5A second round football game between Montini and Marian Central Friday in Woodstock. Montini won the game 40-7. Kyle Grillot - kgrillot@shawmedia.com Marian Central senior Brett Olsen lays on the ground after the final play of the Class 5A second round football game between Montini and Marian Central Friday in Woodstock. Montini won the game 40-7. 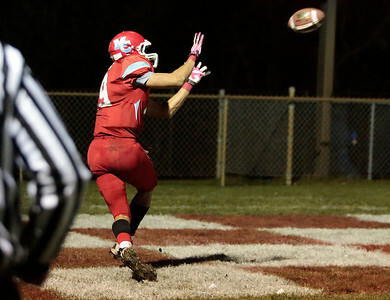 Kyle Grillot - kgrillot@shawmedia.com Marian Central junior Jordan Niemeyer pulls in a catch for a touchdown in the fourth quarter of the Class 5A second round football game between Montini and Marian Central Friday in Woodstock. Montini won the game 40-7. Kyle Grillot - kgrillot@shawmedia.com Marian Central senior Brett Olsen takes a moment to himself after the end of the Class 5A second round football game between Montini and Marian Central Friday in Woodstock. Montini won the game 40-7. 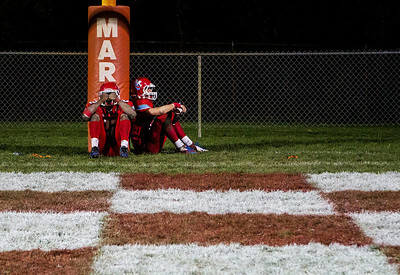 Kyle Grillot - kgrillot@shawmedia.com Marian Central seniors Ephriam Lee and Brett Olsen take a final moment to themselves on the field after the end of the Class 5A second round football game between Montini and Marian Central Friday in Woodstock. Montini won the game 40-7. 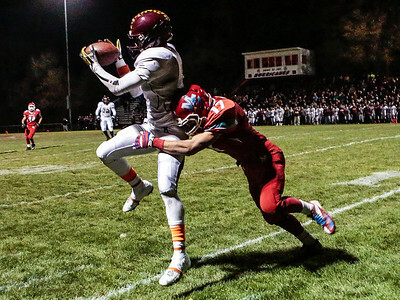 Marian Central senior Ephriam Lee can't catch Montini sophomore Dylan Maher as he extends to catch a ball during the third quarter of the Class 5A second round football game between Montini and Marian Central Friday in Woodstock. Montini won the game 40-7.